The timeframe of the graph would also suggest a role for wholesale outsourcing of certain industries and their local suppliers, global competition, internet/mail order, publishing industry nose dive, . . .
A lot of things have changed since the 1970s. 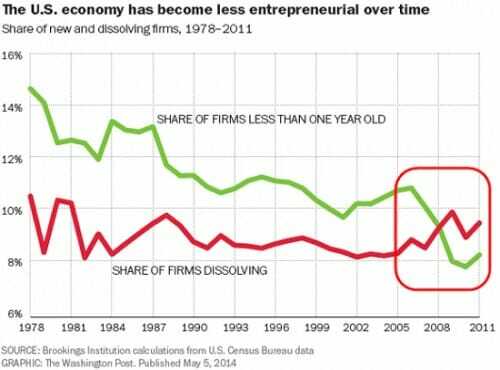 No doubt corporatism and regulation act as deterrents to new business formation, but this graph just isn't that compelling. The lines cross during the recession which featured one of the most serious disruptions in credit availability since the Depression. Additionally, home equity, a major source of financing for new entrepreneurs, fell drastically. Given that it only includes data up to 2011 it might be wise to wait and see if the data reverses before proclaiming the end of start-ups. That would be the type of tort action that impacts giant corporations, not start-ups. entrants and/or makes it harder to compete for smaller upstarts." Lack of entrepreneurship is killing employment, especially employment of the young. We are working on our own lost generation in the US. Europe already has one. Equally relevant is that there are one hell of a lot more one-man endeavors than in the past, probably a fair number of 2-3 man endeavors operating outside the official purview of the Gummint State. One of the key developments starting in the mid-1990s was this new thingummy they call "The Internets", which leads to a lot of people doing stuff in a one-off kinda way that gets them money. How many one-man firms operate out of an Amazon storefront nowadays? Does this metric count them? I suspect not. They also dodge a lot of the Gummint regs by doing that, too. I would guess a business on Amazon would need a business license to actually operate. You might be thinking about eBay where anyone can sell anything. It has gone largely official as well though. Lyft just came to St. Louis, and the taxi commission just couldn't get to court fast enough. But of course it's all about safety. I think there may be a much more simple explanation of the last decade and a half, particularly the rise after 2000 (the internet bust) and the fall after 2006, the beginning of the collapse of the housing market. When the internet bubble burst after 2000, there was a lot of money that needed a home and investors had gotten very used to extraordinary returns. That money made in internet stocks was put into home building and thousands of small business sprang up to build out the boom. By 2006, it was clear that that the real estate market had peaked since prices were so high, it was impossible, even using teaser loan rates and liar loans that no housing had gotten to the point where home ownership was out of reach for 75% of the population. After 2008, the market collapsed and likely cleared out anyone hoping to remain in the housing construction market after the boom, except for a few of the least leveraged builders. The bump is the mid 80's likely has the same explanation. So I think housing explains the bumps and wiggles on the downward trend, particularly the deep swoon in 2010. Ironically, high regulated California has been the epicenter of housing boom bust cycles for the last 40 years. The overall downward trend likely does not have a single factor behind it but multiple ones but it all might tie into the availability of money at low interest rates. The first factor to come to mind is globalization of economies which let to movement of manufacturing to the lowest cost producer. This globalization of manufacturing created opportunities of multinational corporations who could better take advantage of this low cost supply chain. The growth of the big box retailers likely fed the drive to push costs lower because they used their marketing muscle to stock their stores at the expense of the big manufacturing corporations. (The power tools on Home Depot's and Lowe's shelves are not purchased by these retailers at wholesale price. The power tool companies lobby to get shelf space to stock and are paid after the product sells. This practice is not limited to hardware by any means.) It means that multinational companies must finance the goods on the shelves so the availability money becomes a factor as well. Who can best tap into lowest cost loans or the corporate bond markets? It's not the entrepreneurs, it the large well established corporate players. The little guys are likely getting quoted interest rates that are 5-8% higher if they can get a loan at all. Look at the countries that have cut interest rates to near zero for extended periods of time after recessions and beyond, they all drop into low growth rates where monetary power of the big players creates cost differentials to entrepreneurs who are in a different league when it comes to financing. The real stiffler of entrepreneurship may be cheap money that is only available to a select few. By the way, if you go to this site http://www.federalreserve.gov/releases/h15/data.htm and plot the anual Federal Funds Rate over the same time period, you'll see the rate generally falls over the last 35 years, just as the share of businesses less than one year old does. If you want to go to the data file directly it's here, http://www.federalreserve.gov/datadownload/Output.aspx?rel=H15&series=c7ca9f58d350a500bb83e230e208cf9b&lastObs=&from=&to=&filetype=csv&label=include&layout=seriescolumn. Wouldn't that outsourcing lead to more new companies? After all, if I have an idea of for a new toy I can design it myself - no need for a design team thanks to modern software - and start manufacturing it without having to raise enough capital to build a factory. 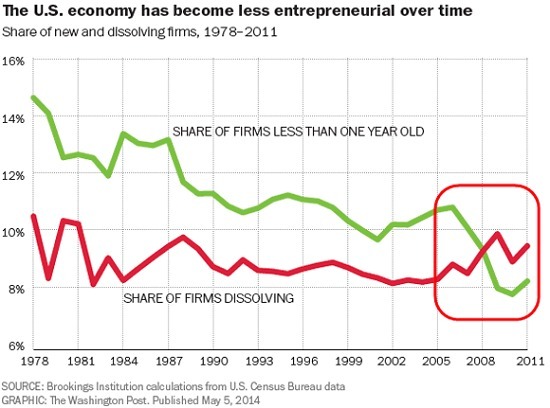 It would seem that trend, if anything, would lead to more new businesses, not less. A same different sort of stink is being raised in MPLStown over Lyft and Uber. I do have some empathy for the traditional taxis. The city mucks around a lot with the maximum and minimum rates they charge and some other costs. "The city mucks around a lot with the maximum and minimum rates they charge and some other costs." That's what they get for asking the City to limit their competition. More companies outside the US. Take TVs, appliances, cars. . . The vast majority of the production and supply chain has moved outside the US over the last few decades. A designer in a basement is not a successful business plan. The capital and means of production is what matters. Most commercial ideas are created in house with paid talent writing company patents. A few rare patents are purchased, but working in isolation without feedback from others, institutional support for prototypes and testing, detailed knowledge of manufacturing economics, supply chain logistics, sales and marketing, or the ear of the people holding the purse strings is not the recipe for success. And no, 3D printing is not the future unless you sell 3D printers. "They also dodge a lot of the Gummint regs by doing that, too." This is kind of the key point. Uber and AirBnb and all that sort of operation exist *specifically* to dodge regulations. People are pointing to Uber and saying "how innovative, why hasn't anyone else thought of this before", but the reason nobody else thought of it before is that nobody was quite willing to say "screw you" to the government on that scale. There is no philosophical difference between Uber and your grandmother making tamales in her kitchen and selling them to the neighbors. Just because one has a piece of paper does not mean one doesn't do a lot of stuff off the books. The main use of business licensure is to limit competition and chase away the honest guys.